The Affectionate One decided that Santa needed a makeover now that we live in Texas. I kinda like it! How would YOU give Santa a makeover, if given the chance? 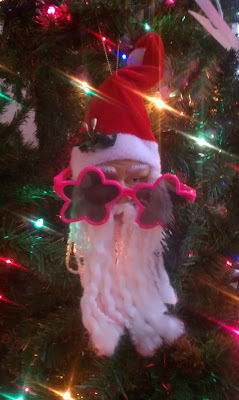 I wish Santa needed sunglasses here in Maine. Right now he needs some spikes for the bottom of his boots. It's super icy right now. Happy holidays! yay!! Santa now has Texas style ;) awesome Now he just needs some snakeskin boots! OOooooOOOoo! Snakeskin boots sounds like a good idea! Here in Texas Santa needs sunglasses year round, and maybe a cowboy hat.